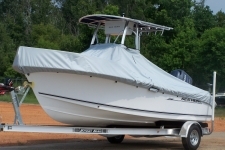 Like Boat Covers Direct®, the Sea Hunt manufacturing company is located in South Carolina. Sea Hunt is known for making unique and dependable center console boats with t-tops, bay boats, and walkarounds. Carver Industries is dedicated to manufacturing a great looking and fitting cover. Our custom covers are designed only for the boat listed—they are very specifically measured and cut for the snuggest possible fit. Many of our Sea Hunt boat covers, such as the Gamefish 240 and the Triton 220, are slotted for the t-top.This means that the cover has Velcro that goes around the legs of the t-top.Knowing how best to cover a boat for the best fit and protection is part of what sets a Carver boat cover apart from the competition. Other reasons to choose Carver include over 30 years of experience fitting boats, made in the USA quality, and outstanding customer service. To shop for your cover, choose your model below or pick your cover by size and style. Since 2001, Boat Covers Direct® has been proud to offer Carver boat covers for SEA HUNT boats. Made in the USA in Landrum, SC, these covers are manufactured using cutting edge technology in areas including material handling, cutting, and sewing. Over 30 years of experience have taught Carver important lessons in fabric choice and finishing for longevity. We believe that our customers are loyal to us because we take care of them. We stock popular SEA HUNT covers and ship them out quickly, usually the same day that you place your order. Our customers like purchasing Made in the USA products, and selling these top quality covers and tops is important to us. Even though you only need to purchase a cover every 5, 7, or sometimes every 10 years, we want you to remember where you received the best cover and the most value for your money.